These are lyrics by Our Lady Peace that we think are kind of repetitive. Our Lady Peace's, "All For You"
Got me where you want, It�s all for you! These two lines are repeated a lot throughout the song, especially towards the very end. We are, we are all innocent. I love this song and this band to pieces, but this is the entire chorus! And at the end of the song it's repeated even more! Ok, then move and stop the whining! 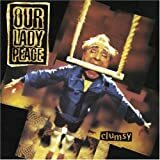 Our Lady Peace's, "Somewhere Out There"
Ok, I get it! Some chick is your 'star' and she's just out of your grasp. Yeah, yeah...I've heard that before! Now stop complaining already, Raine! Our Lady Peace's, "Superman's Dead"
Not only does this not make sense, it is so redundant! Some songs just get on my nerves easily!